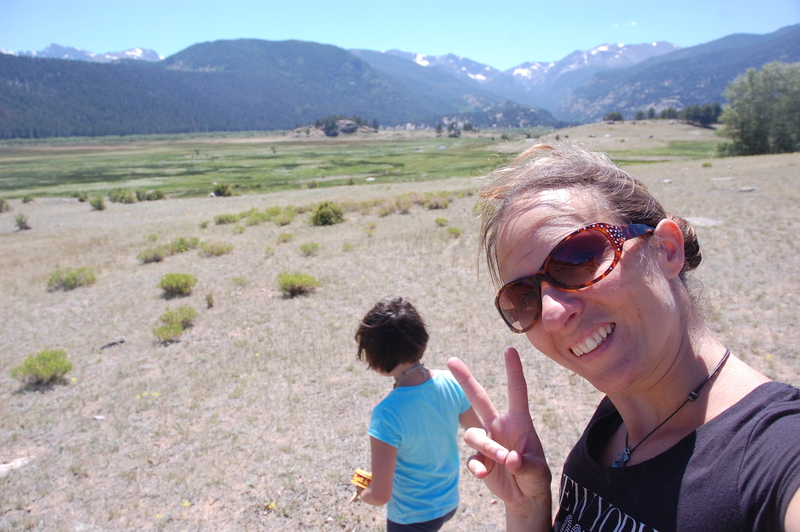 Greetings from Rocky Mountain National Park. You can get here in two long driving days (Corey and I once did that). A smarter way to go would be to take three moderately long driving days. It took the three of us nearly a week to get here. All the adventures on Route 20 and the sharp journey downward to Cheyenne made our entry into the mountains just that much more exciting. I thought that maybe the slow ascent would help with the altitude adjustment, but I was pretty light headed the first day here (Corey and Henna did not seem affected by the 8,000 + feet of our campground). We spent the first day exploring the campground and the adjacent valley. Do you want to see herds of elk, a lot of pretty birds, and mountain flowers set against a rugged mountain landscape? Come here. Do you want to escape road work and roast marshmallows? Stay home. 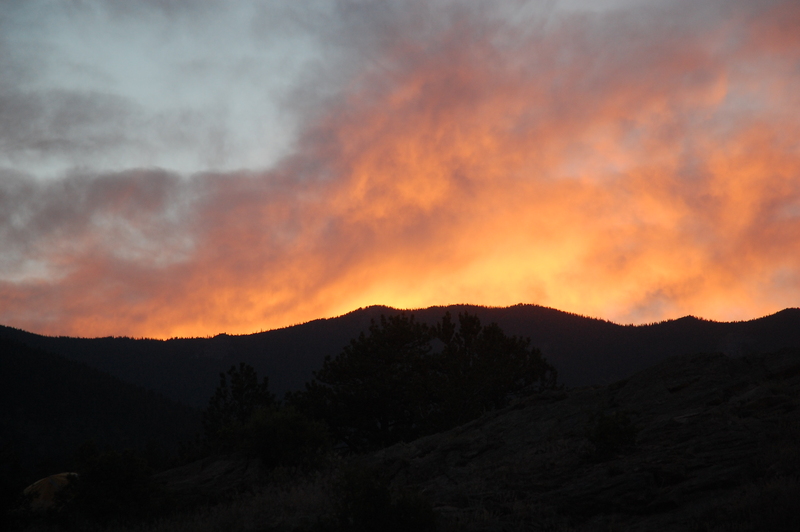 The wildfires near Fort Collins and the extremely dry conditions have forced the park rangers to put a total ban on all fires (campfires, smoking outside your car, and charcoal included). And there also is a massive road work project going on resulting in the Bear Lake Road (probably the second most popular destination here after the Trail Ridge Road) with a road closure from 9AM to 4PM (free shuttle park busses are allowed on the road during that time). A campground on this road is closed for the summer making our campground (usually a first come first served) more crowded than typical. None of this bothered us. We came in on Thursday and grabbed a beautiful site with a trail leading up a short ridge behind our tent. From that ridge we can see the mountain valley. 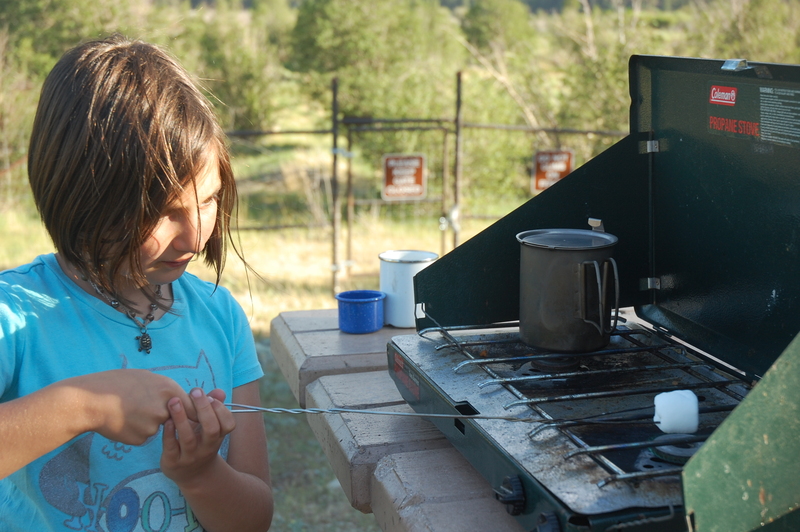 The fire ban mean going to bed earlier but Henna snuck a smore on on our propane stove. And the road closures meant a less crowded Bear Lake when we drove there after 4. The only drawback to our campsite was that our tent and picnic table were a good and steep distance from our car. This was solved with team work as the three of us formed a conveyor line to get all the necessary materials to the top. We also ate all our dinners out at various picnic tables throughout the park. Highlights of the time spent here were our first good hike (to Cub Lake), hanging out at a national park campground where even on a crowded weekend you have spacious sites and quiet at night, and watching Henna build a very detailed acorn village complete with characters such as the king, Gracie, and a fat and lazy dad (not sure how I feel about that one). Today we break camp to travel the highest public road in North America- Trail Ridge Road which tops out at over 12,000 feet. Our plan is to camp tonight on the other side of that road and then enjoy two blissful days in Breckenridge. Talk to you soon. 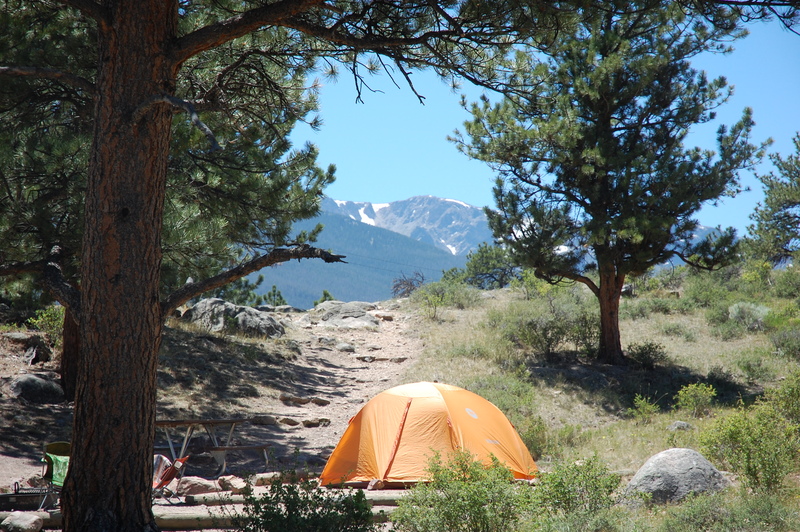 This entry was posted in 2012 Summer Trip, Cowboy West and tagged Moraine Park Campground, Rocky Mountain National Park by hennacornoelidays. Bookmark the permalink. Aren’t you guys traveling too? Great Post – loving your photos:) Happy Sunday! What a great blog! Just out of curiosity, what campsite # is in your second picture (one with the orange tent) thanks again for all this information. Much appreciated! Sorry, I don’t remember the campsite number. Great campground though; you should be happy wherever you set up. Also a lot of picnic areas near the campground that are worth checking out.